Since 2013 PUFFS Vape Shop has helped thousands of Kansans quit smoking cancer-causing cigarettes through the use of personal vaporizers. PUFFS Vape Shop will carefully assist you in finding a vaporizer suited for your specific needs that will work in combination with over 300+ affordable flavors of e-liquid to help you finally quit smoking once and for all! PUFFS Vape Shop knows that making the switch from smoking cigarettes to vaping can be a challenge and PUFFS Vape Shop specializes in working with FIRST-TIME vapers, answering all questions and concerns before making a sale. 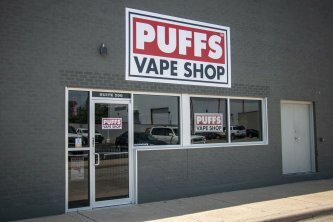 PUFFS Vape Shop is the home of Wichita’s most AFFORDABLE e-juice!!! Visit our store and start living a happier, healthier, smoke-free life today!